Congratulations to TV Tacoma on updating their outmoded tungsten lighting with a technically-advanced, energy-efficient Brightline and LupoLux system. The new lighting installation illuminates six sets, doubling the functionality of existing distribution capacity, while reducing electrical usage by over 75%. WAGA-TV, Fox-5, Atlanta debuts its modern, open and refreshing new set from Devlin Design under a versatile Brightline SeriesONE, BL.16, and Lupolux lighting package, mixing LED and fluorescent sources at 5600 degrees Kelvin to complement the sea blue tonality of the scenic design. Fun Fact: In the mid-nineties, Brightline’s Joe Cervone and Earl Thomas relit WAGA. David Wallimann is an online phenomenon, with more than 39,000 subscribers his YouTube Channel, The Wallimann Show leads the way in virtual guitar lessons, reviews and theory. In this video, he goes off-topic to discuss the lighting issues he had in his small studio and how Brightline came to the rescue. Brightline provided the R-view solution that increases the production value of his videos and gives him more flexibility in creating more lessons. See his video here and learn more about David at www.davidwallimann.com. When we first arrived at Omidyar Network to survey their telepresence and videoconference rooms, we noticed the elegance of their mission statement, modestly placed on a reception wall, but quickly got down to the business of measuring distances, noting light elements, color temperatures, and camera and projection locations. Five countries and eight facilities later, we became curious about just what this client did in fact do in these rooms: Omidyar Network, a philanthropic firm, is truly in the business of improving the world by improving the lives of the people who inhabit it. The vision of Pierre Omidyar, the founder of eBay, and his wife, Pam, Omidyar Network is tasked with empowering individuals to develop new services and businesses and in doing so, enhance their own communities. How does a team of individuals headquartered in Redwood City, CA effectively reach their colleagues, employees, and grantees globally? 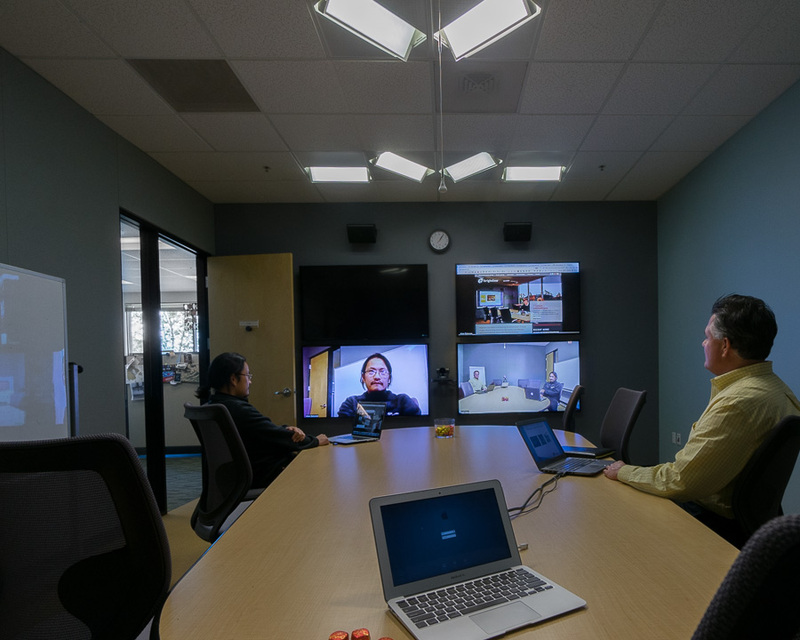 Being tech-savvy Silicon Valley entrepreneurs, they naturally leverage technology, specifically, videoconferencing and telepresence technology. For this illusionary technique to effectively work, lighting is the critical component, and this is where Brightline fits in to the picture, literally illuminating for comprehension and comfort, while exceeding the globally-growing consciousness of minimizing energy consumption. 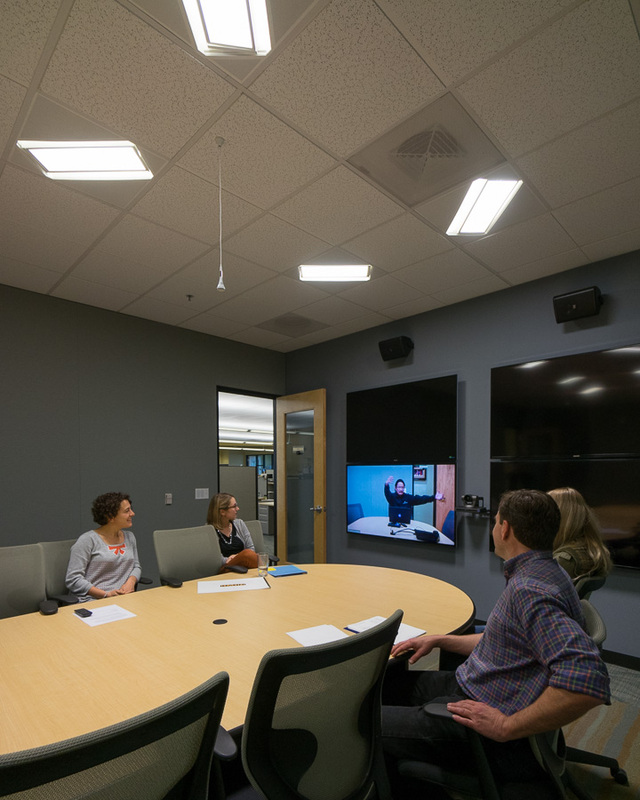 Brightline worked with Omidyar Network’s IT and Facilities management to design low-wattage lighting solutions for their high-functioning video communication rooms. At Brightline, we are proud to play a critical part in the efforts of such a premier and admirable organization as Omidyar Network, enhancing their video communication product as they enhance lives across the world. (6) 2-lamp T-Series, DALI dimmable fixtures, 45° Mount with Narrow Field Control Screens and 3200°K Lamps. (2) 2-lamp T-Series, DALI dimmable fixtures, Offset Mount With Medium Field Control Screens and 3200°K Lamps. TVG Network refreshes their anchor desk, living room set, and displays while adding a new Brightline lighting system to enhance their broadcast for HD. See the full video tour at NewscastStudio. NewscastStudio is spending time up close and personal with Brightline & Devlin Design Group at this year’s NAB Show. 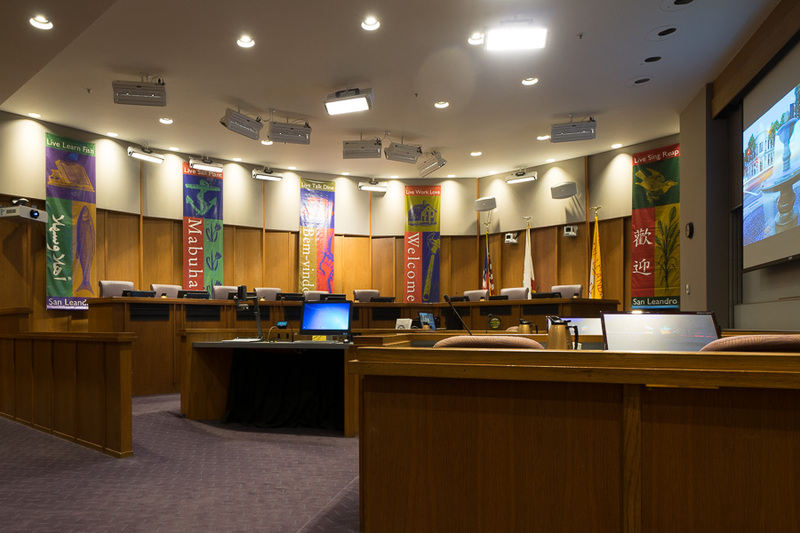 The City of San Leandro recently completed a substantial renovation of the audio, video and broadcast system for their City Council meeting room. Their upgrade consisted of four Sony HD cameras, new lighting and audio, and a new voting system. The voting system includes touch pads on the dais and at the clerk’s desk. A master control room, as well as multiple video screens in the chambers and in overflow seating areas, was added. A broadcast-quality Brightline lighting system was integrated to illuminate the council with front and back light. The Council selected Brightline SeriesONE, with a white custom finish, to complement the room aesthetics. DALI dimming control integrates through an RS-232 conversion device to the Council’s AV processor. The energy-efficient Brightline lighting system provides for a rich video look that is comfortable for the Council’s members. With these state-of-the-art upgrades, the City Council can now broadcast on local cable feeds from Comcast and AT&T. 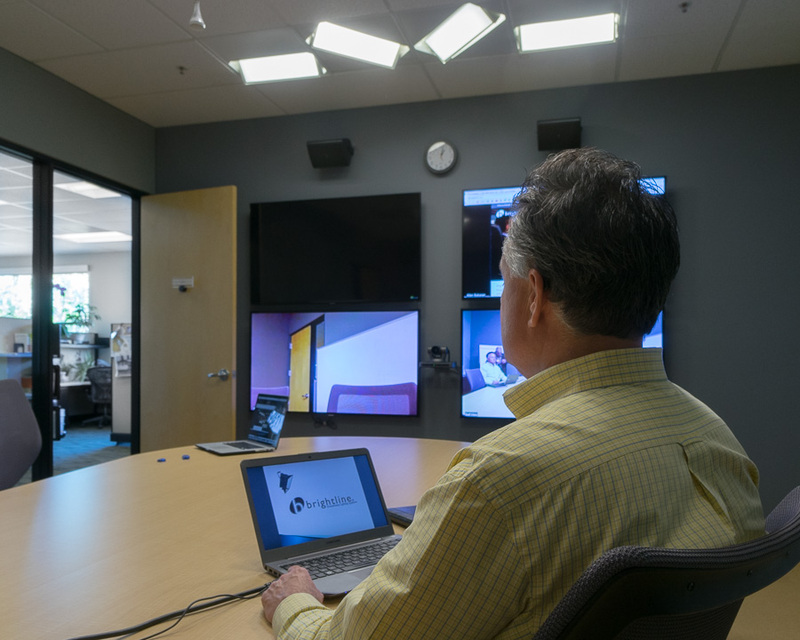 Michael Graves continues his multi-part series on home videoconferencing set-ups with a full analysis on the Brightline i-Series 22-inch fixture. “In the weeks since I started using the i/S-22 I’ve had no further complaints about the lighting in my office. From discussion with some co-workers the added lighting seems to be well received…” For the full review, go to Graves on SOHO Technology. The many non-verbal communication nuances of facial expression and eye contact are critical to effective communications. The i-Series enhances visual clarity, thereby increasing the readable content within a video image and raising the engagement level of participants in the conference. In a multi-part series, technology blogger, Michael Graves reviews the 22″ i-Series fixture. “I have seen the light…and you can, too! As I described previously, I’ve been making use of a lot more video calling my working life. Even beyond that fact, some have said that I’m occasionally in the dark.” To read his full analysis on his home office set-up and of the i-Series fixture, go to Graves On SOHO Technology.